Moisture causes millions in property damage every year, and can lead to serious problems such as structural instability and mold growth. AdvantaClean can detect and remove moisture and the damage it causes. We also install preventative solutions to prevent future moisture buildup in your Washington DC home or business. Moisture can accumulate in homes in a variety of areas. A leaking skylight or roof, an improperly weatherproofed window, and a leaky pipe area are common sources of moisture in homes across the greater Washington DC area. Moisture buildup can damage your home’s walls, floors, and furnishings, costing you thousands and leading to more serious problems. Attics - The absence of proper attic ventilation allows moisture to become trapped in the attic, potentially causing attic mold growth. Basements - The lack of a basement ventilation system and/or basement dehumidifier can contribute to basement humidity control issues. 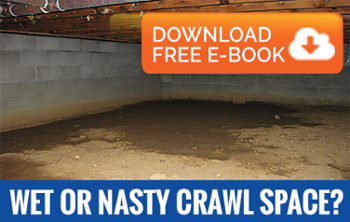 Crawlspaces - Many crawl spaces have an exposed earthen floor, which allows ground moisture to evaporate into the space under your home, increasing the crawl space moisture levels in both the air and sub-structure of your home – especially if you don’t have a vapor barrier. If you operate a Washington DC restaurant or other facility with a commercial kitchen, moisture is a serious risk. Commercial cooking appliances and dish washing areas are major sources of steam that can accumulate on walls and ceilings. If left unchecked, moisture can damage your facility and lead to mold growth- a serious problem in a food preparation environment. Laundry facilities are a common area for moisture buildup to occur due to the multitude of pipes, fittings, and appliances transporting water. A clogged drain, leaky gasket, or loose fitting can allow moisture to build up unnoticed. Moisture buildup is a serious problem in laundry areas because of the damage that it can do to walls, ceilings, and appliances. If moisture is left unaddressed, it can lead to mold growth which can quickly spread to towels, sheets, and other laundry. Toilets, Sinks, and Showers in restrooms often contribute to moisture buildup in restrooms. This can lead to slips and falls in addition to property damage, leading to significant liability and repair costs. AdvantaClean has been a trusted moisture removal and prevention services provider for more than twenty years. If you notice signs of moisture buildup in your home or commercial property, contact us as soon as possible to schedule a technician visit. Washington crawl space moisture control solution experts! Call Us Today – (202) 875-5633!